How do the Sand Forms in the Waveform in the Desert? 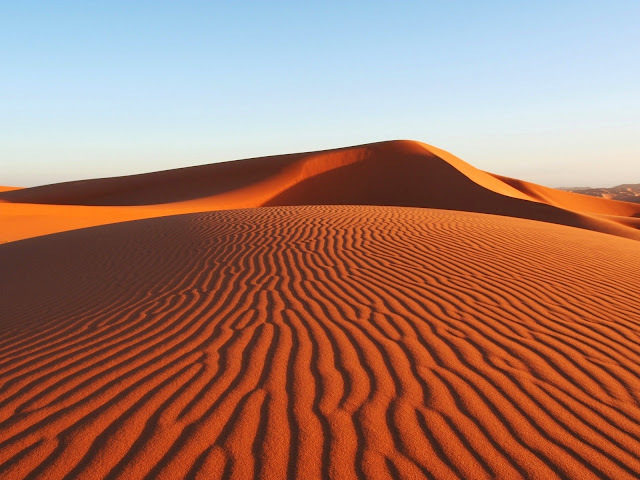 The shapes formed by the sand / grains in the desert and on the sand are the most interesting examples in nature in the case of spontaneous regeneration. These shapes are formed by the force applied by the force of the wind on the sand particles. Three forces determine how a sand will behave under the influence of the wind. The gravitational force is the force that keeps the tide on the ground. The wind allows the sand to drift in the direction of the estuary. In addition, the difference in pressure that occurs when the wind moves on the surface of the sand will cause a lift force to act on the tannery - similar to what occurs in the flank's wing. It determines the speed of the wind with its mass, shape and density, how much the sand will rise with the influence of the wind and how far it will move. For example, sand particles with a large density and mass can only be dragged on the ground. Some particles rise slightly with the effect of lifting force, after falling for a short time in the air then fall again. Very small particles are transported to higher and further distances. These differences in the motion of the particles lead to the formation of unsymmetrical, wave-shaped sand peaks. The resulting sand dunes are stuck with a patch, the other slope is low. In fact, these shapes are also seen in sand deposits of smaller dimensions known as sand ripples. The height of these structures generally ranges from 4 to 60 centimeters.